We have reserved accommodations in university residences (a.k.a. “dorms”), and in the Simon Hotel at Simon Fraser University, for the nights of August 11-15. A campus map for “SFU Burnaby” may be found at: www.sfu.ca/fs/Campus-Facility-Profiles/Campus-Maps.html. The residences and Hotel are on the left (west side of campus); our meeting rooms will be towards the northeastern part of campus, about 700m from the residences. Most persons should book rooms directly with SFU conference services through their web site: www.sfuaccommodations.ca/reservations. The site has links to more complete descriptions of the rooms. 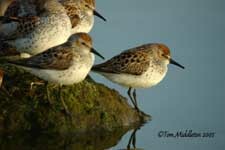 If present, fill out the Group Booking form listed as “2011 - Shorebird meeting”. After 30 June, if the meeting is not listed, register as an individual and indicate in the comments that you are associated with the Shorebird Meeting. You may book for a few additional days either before or after the meeting. The site requires Visa or Mastercard information to complete and hold the booking, but no charge will be put on the card until checkout after the meeting. If reservation using a Visa or Mastercard is not possible, or you expect your accommodation costs to be covered by meeting travel awards, please email whsgmeet@sfu.ca to obtain an accommodations registration form. Complimentary parking onsite, morning newspaper, local phone calls, and wireless high speed internet access. How to drive to SFU from this Hotel. How to take the public transport to SFU from this Hotel.